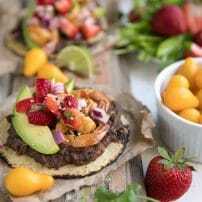 The perfect lunch or dinner, these easy & healthy tostadas are like little bits of summer teamed together in every little perfect bite. I almost didn’t post this. Actually, I take that back… I almost didn’t post these photos. I was going to wait and re-shoot because I wanted the photos just right. But, more than three months has passed and I have yet to remake this recipe. 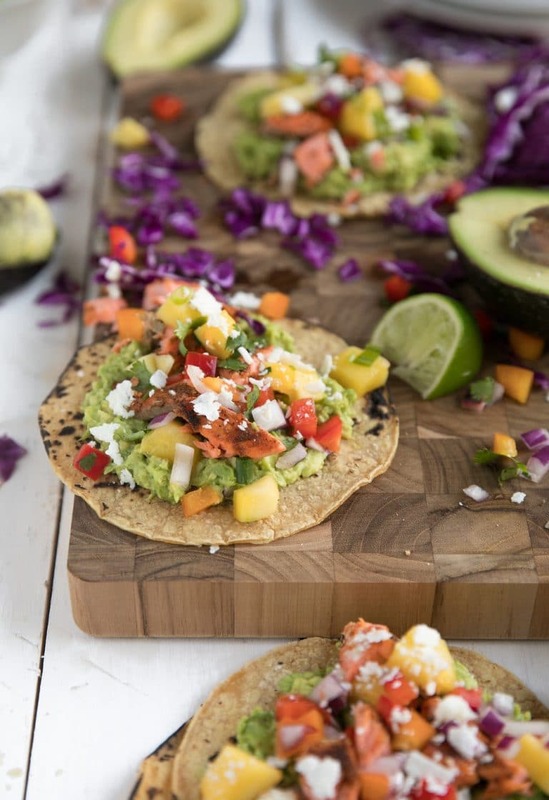 Before I totally scare you away, I promise it’s not because these tostadas aren’t awesome. You guys, they’re totally awesome. However, the only thing I make on repeat these days is mac n cheese and chicken nuggets. I can’t remember the last time I made the same thing twice within a reasonable amount of time (I’ve made many similar recipes, but none are never really the same). 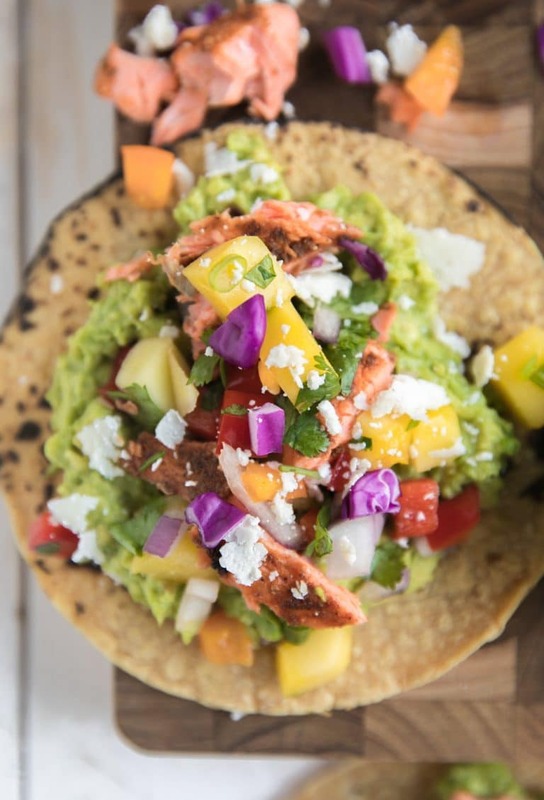 So, if you’re in need of a super yummy, super healthy salmon recipe, this may just be the one! 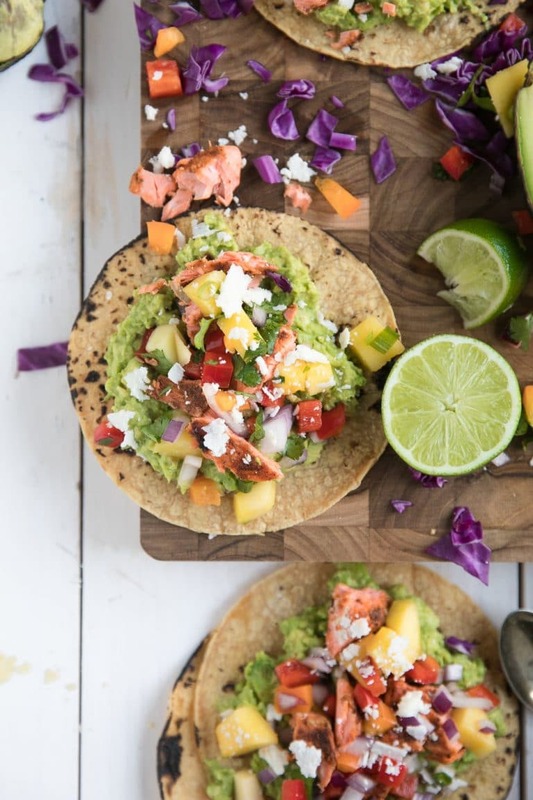 In a medium bowl toss together the diced pineapple, mango, red onion, diced bell peppers, chopped cilantro and fresh lime juice. Add a small pinch of salt to taste and set aside. 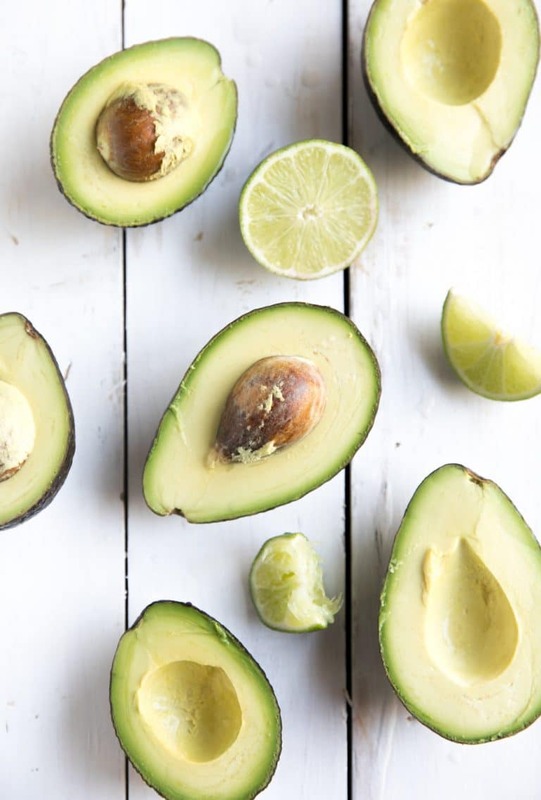 To prepare the smashed avocado, remove the pit from each avocado and add the avocado to a small bowl. To the avocado, add the lime juice and salt to taste. Use a large fork to roughly mash the avocado until it reaches desired consistency (I prefer mine chunky). Set aside. Bring salmon to room temperature and pat dry with a paper towel. In a small bowl mix the canola oil with the smoked paprika, garlic powder, cajun seasoning and salt. Rub entire mixture onto the flesh side of the salmon and use your fingers to cover every part of the salmon. Preheat a large skillet over medium high heat. When pan is hot, add butter to the skillet and swirl to coat. Gently place salmon on the hot skillet, flesh-side down. Sauté for 5-6 minutes before flipping and continuing to cook an additional 5 minutes on the other side (note: depending on the thickness of your fillet, cooking time will vary). 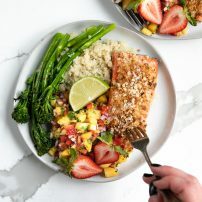 Salmon is finished cooking when flesh feels firm instead of spongy. Remove from heat. 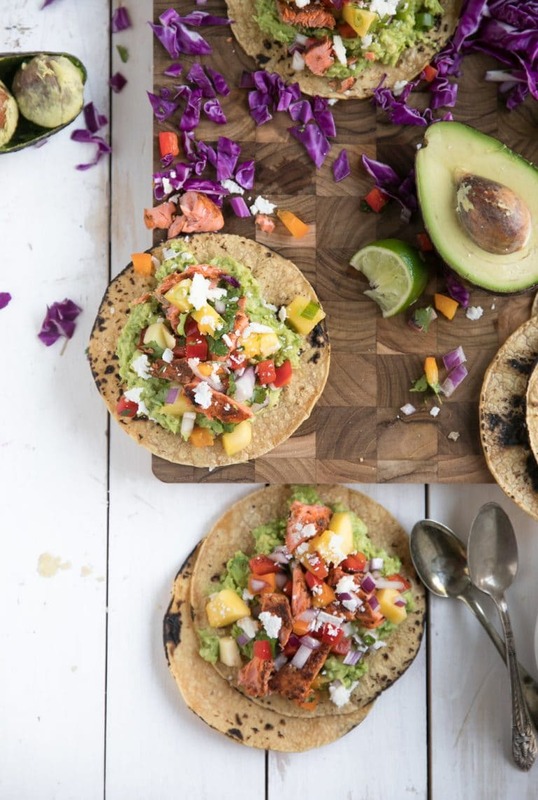 To get crispy charred corn tortillas, place tortilla directly to the burner and cook until crispy (you may want to use tongs to do this). Do NOT leave your tortilla on the burner and walk away- always keep a close eye as it can (and will) catch on fire if left unattended. Use a fork to separate cooked salmon from the skin. 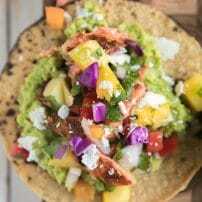 Build your tostadas- start with the avocado smash, followed by salmon and pineapple and mango salsa. Drizzle with a squeeze of fresh lime juice and a few crumbles of cheese.